The use and value of a fleece or lot of wool are affected almost as much by the distribution of the individual fiber diameters as the average fiber diameter or grade. The more uniform the individual fibers are in diameter, the more valuable. An average fiber diameter or grade implies nothing about its distribution within a given quantity of wool. For instance, a lot of wool fiber may contain 50 percent of its fibers at 35 microns and the other 50 percent at 15 microns and still have the same average fiber diameter—25 microns as a lot of wool with only 1 percent of its fibers at these extremes. 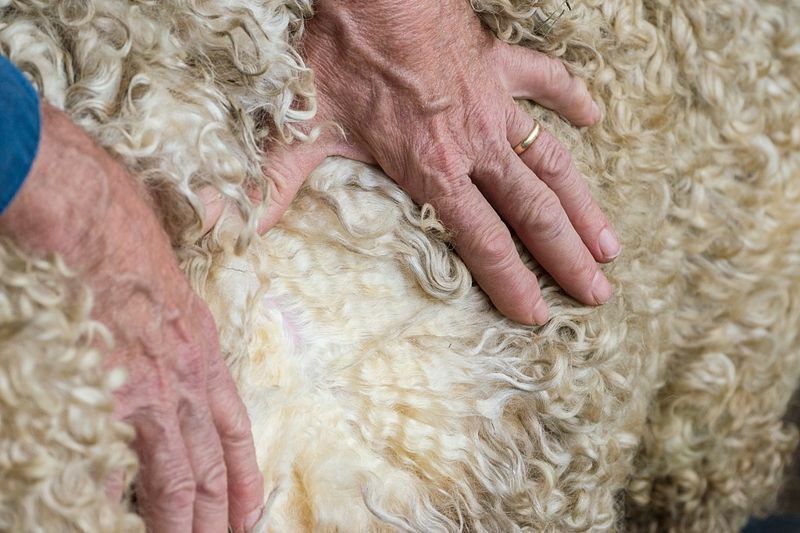 A measure of the amount of variation in fiber diameter within a given lot or fleece has been added as a quality factor to more accurately describe the wool being evaluated. The measure most commonly used to describe the distribution of measurements about an average is the standard deviation. The average fiber diameter plus or minus the standard deviation will encompass roughly two-thirds of all the individual fiber diameters. The more variable the wool is, the larger the standard deviation and the lower the quality. The ASTM (formerly the American Society for Testing Mater) has set up standards for the fiber diameter and variability of the various grades of wool. This standard is based on the average fiber diameter of a sample and the actual distribution of fibers within that fineness range. It prescribes a certain distributional requirement, a maximum allowable standard deviation—to meet standard specifications and makes allowances for distributional differences of given grades. If a lot of sample of wool fails to meet the distributional characteristics of that grade, i.e. has a larger standard deviation than that allowed for that grade, the wool is lowered to the next spinning count grade. In short, variation is expressed in terms of the standard deviation and wools with greater variability than allowable for a particular grade are automatically placed in the next lower grade. Another useful concept in describing the uniformity of fiber diameter within a given quantity of wool is the coefficient of variability. It expresses the variation as a percentage of the average and is usually used when one wishes to compare the variances between two or more lots of wool with differing average diameters. A standard, based on the coefficient of variability, has been derived in recent years for field work with wool. Although an experienced wool grader can usually estimate wool grade fairly accurately, there are exceptions. Even the most experienced wool graders will be wrong some of the time. Sooner or later most wool will be micron tested, either by the producer, the buyer or at the textile mill. A micron test may not always tell the producer what he wants to hear, but it will tell the true story. The normal method of obtaining a sample for micron testing is taking a core test sample. In fact, the cores drawn for clean yield or shrinkage determination are adequate and can also be used to estimate fineness and variability of a lot of wool. For selection purposes, micron tests can be run on samples taken from individual sheep. The most economical way is to cut two square inches of wool from the area marked “A” in Figure. Remember, this measurement will not indicate the amount of fiber diameter variation between the individual’s side and britch, the area marked “B” in Figure. The degree of this variation, however, is very important. It should be assessed visually. In some situations, producers may also want to have a britch sample micron tested. Micron testing both a side and a britch sample should provide a general overall picture of the fleece grade. Once a representative sample has been taken it should be packaged and sent to a wool testing laboratory where the average fiber diameter, the standard deviation and/or coefficient of variation can be determined.